With this testing, Kenworth is one step closer to developing a commercially viable, microturbine-based, hybrid electric truck. The Class 7 work truck operates on a combination of compressed natural gas, a 47kWH Li-Ion battery pack, and diesel fuel. While some may worry about the high-speed performance of hybrid electric trucks, this Class 7 testing confirmed both high-speed performance and operation on 20% grades. Here’s how it works: The microturbine uses compressed natural gas to charge the lithium battery pack, which in turn provides power to the electric traction motors that drive the truck forward. 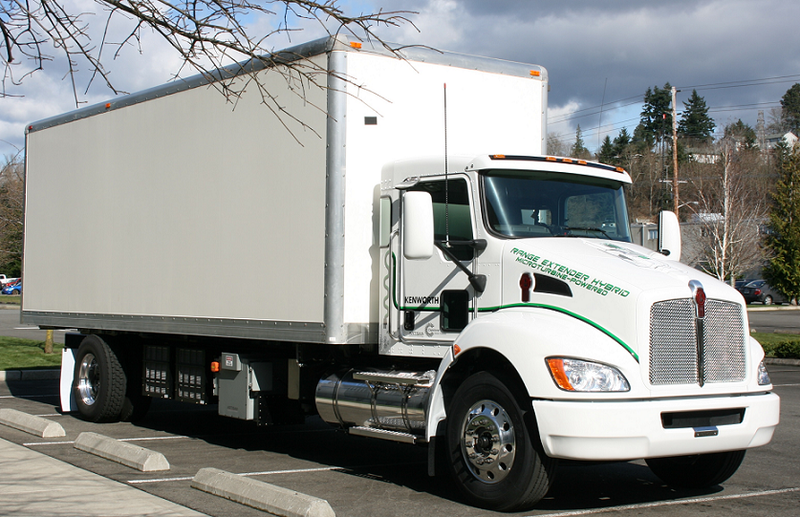 The refrigerated box body of the truck uses the electric power to provide payload cooling while the truck is in motion. This eliminates the need to operate an additional diesel engine generator for cooling purposes and decreases the overall amount of diesel fuel needed. Emissions are also decreased. To compare a microturbine-powered hybrid electric vehicle’s fuel economy, nitrogen oxide and carbon dioxide emissions with a conventional diesel-powered truck drivetrain, Capstone developed city and rural delivery cycle simulations. In simulated short-distance urban delivery routes, the microturbine-powered truck showed triple the miles per gallon of a diesel equivalent truck, with a 65% reduction in greenhouse gases and a 90% reduction in NOx. The trucking industry outlook suggests considerable growth in trucking technology, including electric semi-trucks and other heavy-duty electric hybrids. On top of being good for the environment, improvements in fuel economy can be incredibly cost-effective, especially with the volatility of fuel costs. While the Class 7 hybrid is not yet commercially available, Papé Kenworth carries a full line of new trucks for sale, including the diesel versions of the K370 and K270 delivery trucks. Visit one of our locations in California, Oregon, or Washington today!